While the cardinal rule of politics is “Don’t bite the hand that feeds you,” the funders of the Paris Climate Summit want you to kiss the hand that chokes you. The financial conflict of interest behind the Paris summit—with about 20 percent of the budget brought to you by corporations—is basically an open secret. Corporate Accountability International (CAI) has mapped out the connections between energy corporations sponsoring the event, policymakers, and international bodies to show exactly how well choreographed the conference has become: back-channel diplomatic horse trading, showcases for “business innovation,” a perfunctory nod to “civil society groups” and a tightly controlled smattering of protesters. With every corridor festooned with corporate logos, the atmosphere of COP21 reflects the ethical questions left off the table. Arguably, corporations have every right to participate in the summit as “stakeholders”; you could even say that under the “polluters pay” principle, industry has a duty to help implement a transition to a clean energy system. But the idea of “being part of the solution” only goes so far for an industry that essentially embodies the entire problem through its very existence. Since policymakers have apparently proposed emissions reductions that utterly disregard scientific projections, environmentalists fear industry lobbyists could goad governments to further lower the bar. BNP Paribas is known for investing in Canada’s controversial tar sands projects. Engie, which owns 30 coal-fired power plants worldwide, still devotes the vast majority of its production capacity to nuclear and fossil fuels, and a token 5 percent to renewables, according to an analysis by French environmental groups. transnational corporations have increasingly “captured” states by exerting unmistakable influence over investment, production, and employment at all levels of economic activity, compelling states to adjust their policies in pro-corporate ways. The French government is actually a part-owner of EDF and Engie’s operations, embodying the intimate codependency between business-as-usual and the political status quo. The physical layout of the talks parallels this political asymmetry: community and environmental activists are marginalized from negotiating arenas—particularly under the clampdown on public protest following the Paris terrorist attacks. Yet it’s precisely the excluded groups—and “climate vulnerable nations”—who always pay the social cost of climate injustice, through rising sea levels, collapsed mines, toxic soil, and smog. Despite the corporate influence-peddling, scientific realities still peek out from behind the curtain at Paris: Current levels of energy consumption are unsustainable, and society can either adapt our economic systems or nature must readjust them for us; the only question is when, and how violently, change will occur. Since climate-stressed communities can’t wait for capitalism to enlighten itself, CAI proposes a radical restructuring of the conference by barring fossil fuel-based sponsorship and eliminating “lobbying efforts by fossil fuel and emissions-intensive corporations” from the COP process. Going forward, blocking polluters’ money would demonstrate the principle of tying the project of global decarbonization to a movement for global redistribution of political power. If the ruling elite can’t imagine climate talks without the influence of polluters’ money, how can we imagine a world without dirty fuels? Yet we’re starting to: the massive climate marches leading up to Paris, new strategies of institutional fossil-fuel disinvestment, emerging theories of climate justice in environmental law, community-based renewable-energy generation—all exemplify grassroots alternatives to COP21’s stage-managed dialogue. Paris’s political impasse translates into the world’s call to action: behind the closed-door deal-making, ecologically speaking, what really gets compromised in these talks are principles. 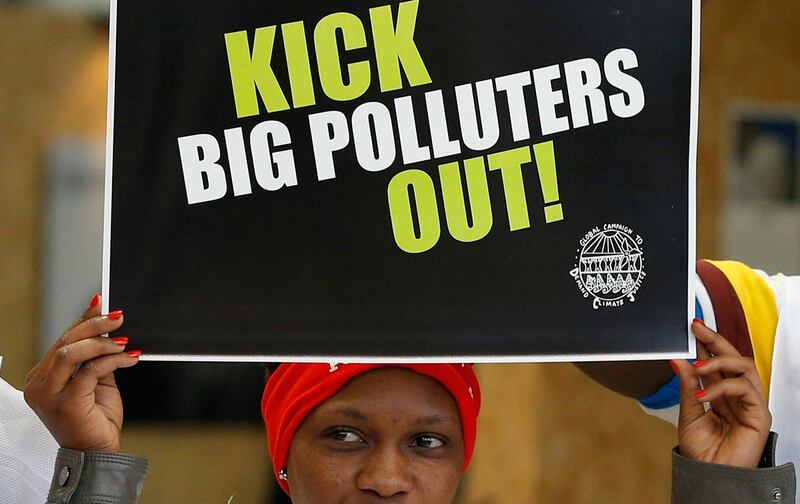 Yes, polluters should pay, but they shouldn’t govern. The fossil-fuel industry’s stake is tied to its environmental debt to society; they can’t demand influence when they owe restitution.